Chris and I are fostering a 10 month old deaf white boxer from Kentucky and his name is Bud. He is the sweetest thing in this world and all of our dogs have really taken to Bud. 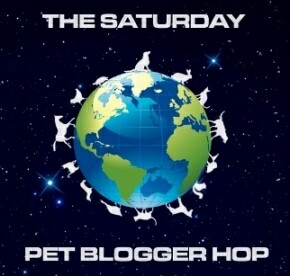 Since we started our other blog and website we are very busy helping deaf dogs find home all over the United States. Bud was out in the country so I felt he would have a much better shot at finding a home if he came here here on the farm for a few weeks to learn his basic canine good citizen training. Over the next few weeks I will teach Bud his ASL sign commands, loose leash walking, crate training and he will be fully socialized by the time he goes to his new home. Here are a few photos I took of Bud and Nitro today in the back yard. Enjoy! The photos below were taken last Thursday when we got back from transporting Bud from Kentucky. We took him to meet Nitro and all of Nitro's buddies at the Salem Rotary Dog Park. He had never ever been to a dog park and he was such a good boy playing with all the other dogs. I was very proud of him. Meeting his "brother from another mother!" They are mirror images of each other with the exception of Nitro's pretty blue eye. Meeting his foster daddy for the first time. Chris was smitten as soon as he met Bud. I saved the best for last. When I took this photo of Bud this morning I was cracking up because it reminded me of the George Costanza pose on Seinfeld. When I finally found George's pose I was laughing so hard because Bud even had his back knee bent. 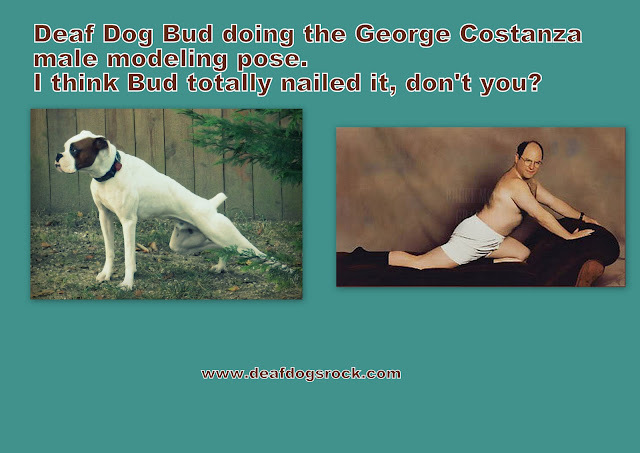 He totally nailed George's pose. What do you all think? Lexi, Tallulah, Bailey, Nitro, Bud, Chris and I wish you a very Happy Labor Day weekend! It has been a few weeks since I have had the opportunity to do any blog posts here on The World According To Lexi. I think it is time for me to do some catching up. Here is a recap over the past 6 weeks. I traveled to Salt Lake City, Utah to attend the BlogPaws Pet Blogger and Social Media Conference. My other dog blog DeafDogsRock.com was honored with the first ever BlogPaws Nose-to-Nose Award for Best Cause Blog so Nitro and I have been crazy busy working hard to promote and save deaf dogs all over the country. We also just celebrated Deaf Dogs Rock first Blogiversary and hitting our goal of 5000 fans on our DDR Facebook page. In the mean time, I have neglected the World According to Lexi so here is a special post to get everyone caught up. This is our Summer Fun 2012 post. Lexi and I hope you are all having an amazing summer this year. Although I could not travel with Nitro I did have my Flat Pet Nitro to bring up with me on stage when we received our special award. Such a beautiful award! I am truly honored and touched. I met some incredible women this year and I am so looking forward to getting to know them better. From L to R: Carol Bryant (Dogster.com), Kristin Elliott (Doodie Pack.com) and myself, Christina Lee. I was so fortunate to meet Lisa Pruitt Smith (left) my first day at the Blogpaws Conference because we had a blast hanging out together at this years social media conference. In the center is Wendy and Hope Diamond with AnimalFair.com. Wendy and Hope Diamond just broke the Guinness World Record for the most expensive dog wedding on July 12, 2012. 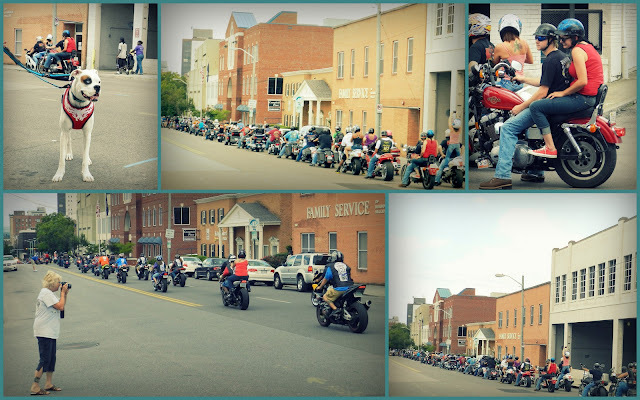 When I got home I got to attend some pretty cool local events. 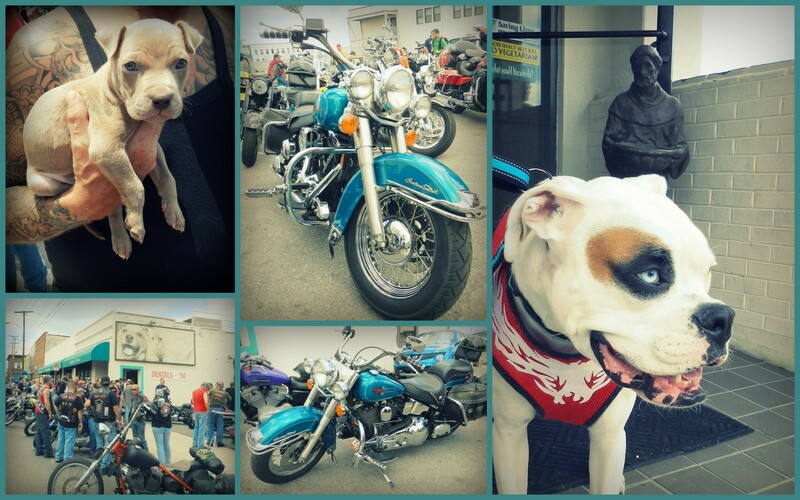 Once such event was the Paws for a Cause Bike Rally held at Angles of Assisi Rescue last weekend. They had an amazing turn out with over 100 riders showing up to support Angles. 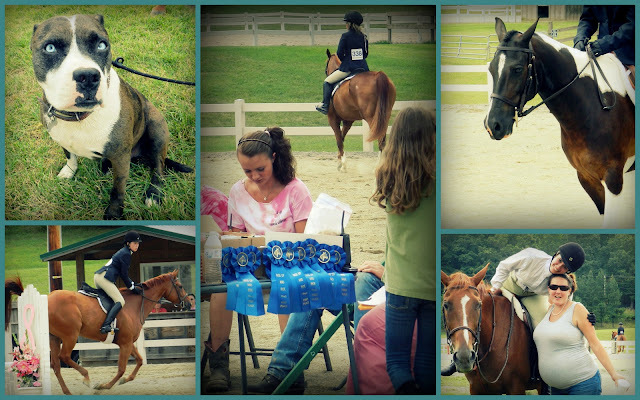 Over $1400.00 dollars was raised to help the animals. Our friend Jill Nelson giving Nitro kisses. Wow what a great turn out. 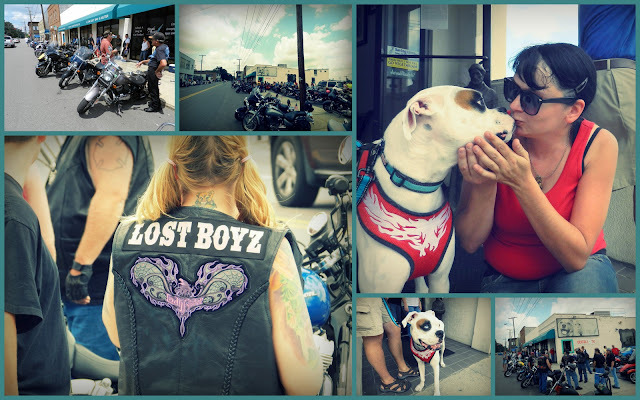 Our local bikers totally ROCK! 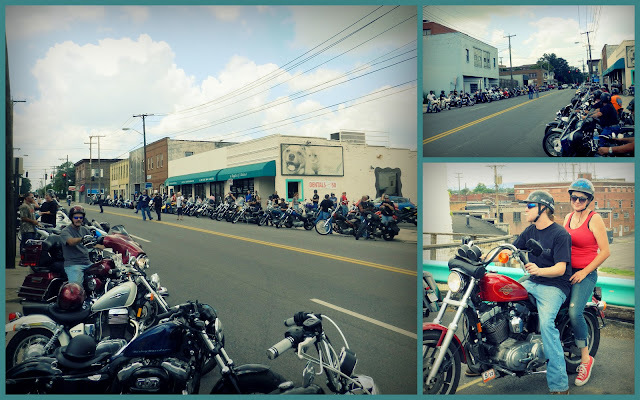 Our friend Charlotte Hale photographing the bikes as they leave. Here are some fun summer photos from the last two weeks. 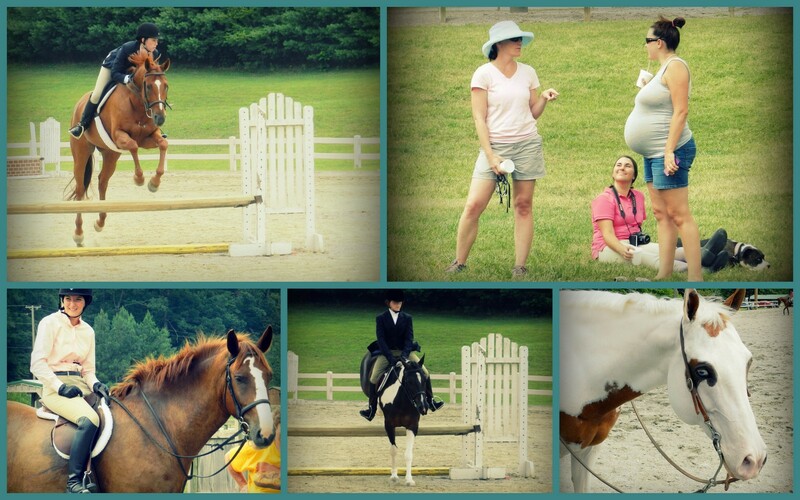 We are having a great summer here on Bluebird Farm in Salem, Virginia. This is Jack cooling off in the pool we brought to the dog park. We purchased two kiddy pools and the dogs just love, love, love the doggy pools (especially Jack). The following photos are of Nitro's morning play group at the dog park.There is about 20 dogs in our playgroup and they are all so well behaved and fun. Bay and Ben going at it and having fun. This is Phoebe and Ben chasing each other. Here is one of Nitro's best buddies Mr. Ozzy playing in the water at the dog park. Ozzy and Loki are in the same family. This is Nitro's other best buddy Loki playing in the water at the dog park. I decided it would be fun to do a mini-photo shoot of my pups one sunny morning here at the farm. This was two weeks ago and here are the results. I love these photos! I actually got a head tilt out of Miss Lexi. She is such a DIVA! This photo should read "got diva?" This is my little princes Miss Tallulah and she totally has me wrapped around her little paw...look at her soft sweet eyes. Tallulah to Nitro: "mine, mine, mine, mine, mine, mine, mine, mine, mine!" 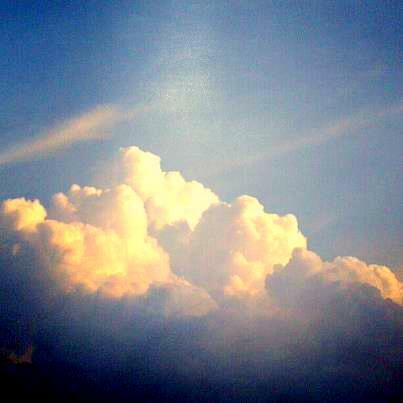 This is an Instagram photo of some beautiful summer clouds. With the hot weather we have been getting some impressive cloud formations lately. 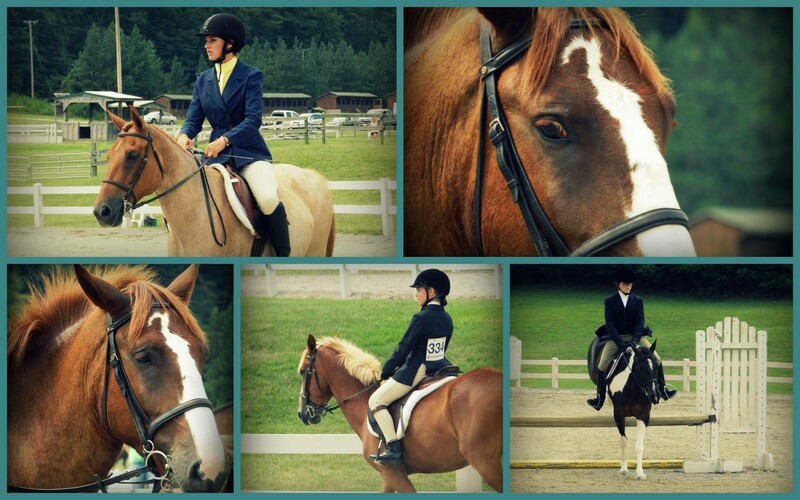 Here are some photos I shot at one of the local horse shows last weekend. This is Judy Pate's Paint Horse. This is exactly how my deaf dog Nitro would look if he had been born a horse. Look at that crystal blue eye on this horse. Speaking of crystal blue eyes, check this pup out! This photo is of my friend Alli's dog. This is one of the sweetest Pit Bulls you will ever meet. What a doll baby! I don't know what it is about animals who have blue eyes but they seem to be very photogenic don't you think? 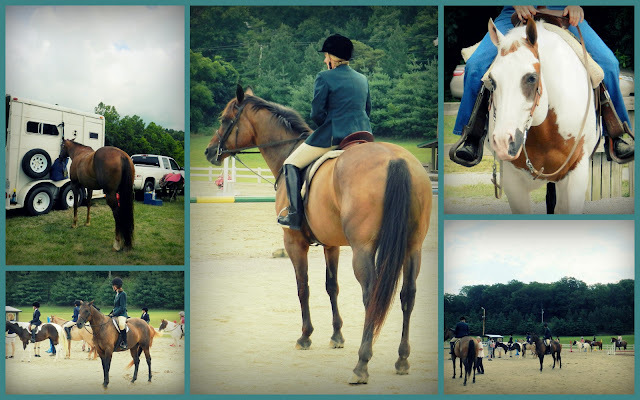 Horse show collages... The lower right photo is of my friend Alli and four days later she gave birth to a beautiful bouncing baby girl. So far we are all having a great summer here around Bluebird farm this year. Lexi and I hope you are all having a great time and that all of you are taking the time out of your busy schedules to enjoy the finer things life has to offer. MUAH!